In late 2008, I was appointed as Britain’s ambassador to Guatemala, Honduras and El Salvador. I was 30 at the time and living in Ethiopia. With a few months to get to grips with Spanish, I arrived in Guatemala City in early 2009 raring to go. I have always taken jobs that appealed to my sense of challenge; jobs that felt in my gut like the right decision. But it wasn’t long after arriving that I started to wonder whether I might finally have bitten off more than I could chew. Looking around me, I felt horribly out of place - half the age of most of my counterparts and one of just five female ambassadors. While some people were incredibly supportive, others started rumours that felt horrible at the time. Maybe my father was a friend of David Miliband – the UK’s then Foreign Secretary. Or perhaps not sending a ‘proper ambassador’ was the UK’s way of insulting Guatemala, which after all was involved in an ongoing territorial dispute with the former British colony Belize. It had been such an honour and an accolade to be Britain’s youngest ever ambassador but now I was worried. Could I really be effective? It took me time to realise that while being young initially made me feel out of my depth, it was also the key to what would give me great strength. By being different and not fitting into the norm, I found that I also had much greater freedom to manoeuvre. I could engage with people who didn’t normally want to speak to ambassadors; I could do things that ambassadors wouldn’t normally be expected to do; and I could attract attention in doing so, which gave me a voice, as well as an audience. One of my proudest achievements from my time in Guatemala, alongside the commercial and consular work, was helping youth groups with a campaign to break the cycle of domestic violence, particularly against girls and women. To raise awareness of the issue, we organised a human chain of more than 12,000 people from the top to the bottom of one of Guatemala’s volcanoes. We brought together survivors of violence, alongside businesses, charities, the media, the church, sports and music stars, government ministers and even the country's President. When I look back on it now, the project was ridiculously ambitious. But we had passion and belief. We wanted to do something that would shift the dial and I was proud that I was able to use my position to help. My age no longer held me back but spurred me on. When I came back from Guatemala in 2012, I worked on the GREAT Britain Campaign promoting the UK overseas and then decided to take some time out of the public sector to work in a young and fast-growing communications company. Suddenly surrounded by entrepreneurs, I was now definitely not ‘the youngest’ anything. These men and women used their 20s to invent new products, to build businesses and to create jobs. After all, my business hero Karren Brady was running her first football club aged 23 and of course Mark Zuckerberg famously launched Facebook aged just 19. But perhaps my greatest challenge to date arrived in August last year when I had children. Now back at work full-time, I am definitely no longer feeling young, but I am happy and more determined than ever to be a strong role model. No doubt they will grow up to do jobs that haven’t been invented yet, in order to pay for a little solar-powered car that will drive them to a party that I will no doubt say they are far too young to go to. But I really will try not to. 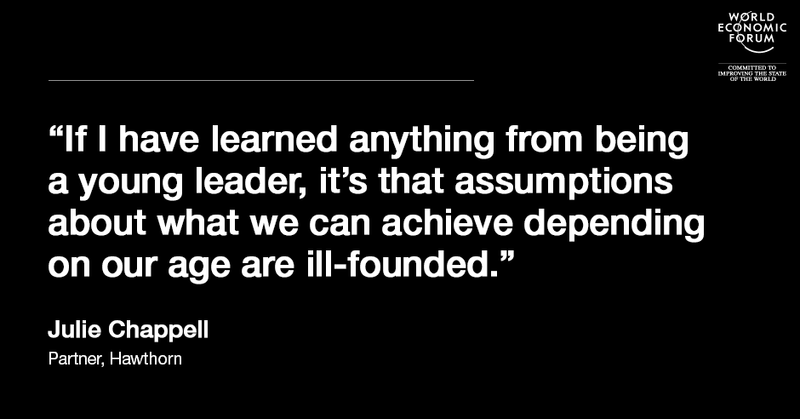 Because if I have learned anything from being a young leader, it’s that assumptions about what we can all do depending on our age (however old or young that may be) tend to be ill-founded. Rather, what I think is important in this era of rapid change is our ability to adapt and to innovate. Irrespective of age, we need to help each other try new things and create an environment in which it’s genuinely acceptable to get things wrong. But giving people the space to fail is, in my experience, much easier to do in a small, private company than a big corporate or government department. This is where networks like the World Economic Forum’s Young Global Leaders become so important, transferring lessons across the public, private and third sector divides, as well as from one country to another.